Just as the world’s seismic shifts have taken people in varying directions, so has art…. Waking up at dawn, when the sun’s rays are beginning to light up a sleeping sky each morning, is the ultimate experience of illumination; a miraculous artwork to which we awaken every day! So when I walked into the illuminated room to experience a James Turrell installation all those many years ago, it felt like I was part of the miracle of life — the sensation of walking in from darkness to a space that gradually illuminates one’s body — where the physical self gets absorbed into the light space; the experience was one of a ‘heightened sense of exhilaration’…. That moment that one holds close in memory, always. ‘Life is Art, Art is Life’ is a very entwined message that I began to live, understand and experience from my early days of running the gallery. Coming from a family with strong political inclinations, it became a natural proclivity for artists to gravitate to a gallery like ours where our little space became an adda for all things that we didn’t know could exist as ‘art’. My early memories are that of Vivan Sundaram’s mammoth works with engine oil, where he walked away from the conventional medium of oil on canvas. 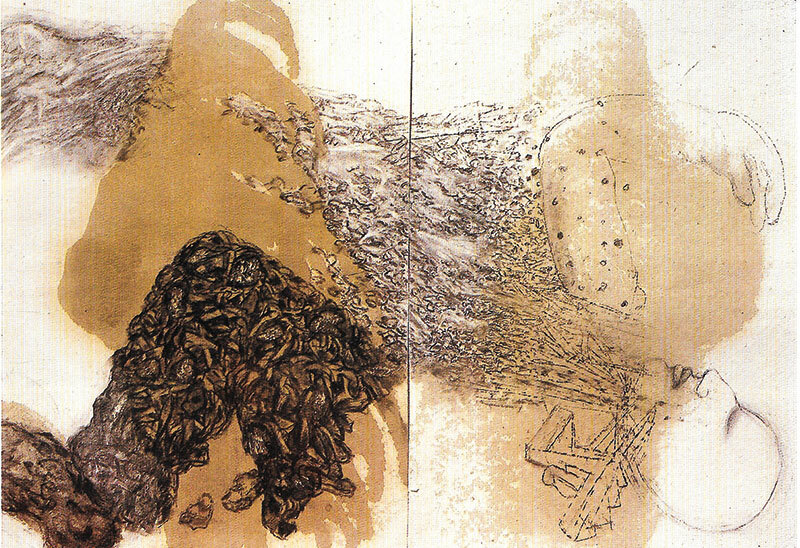 The early ’90s became fraught with the resonance of the Gulf War, which was the beginning of Sundaram’s work in multiple mediums. This was the beginning of installation art in India — which went on to take on so many other forms. The ’90s was also the decade of the breaking down of Babri Masjid, now a marker for artists who began to use mediums other than canvas — where conventional methods were replaced by site-specific installations, video and performance. 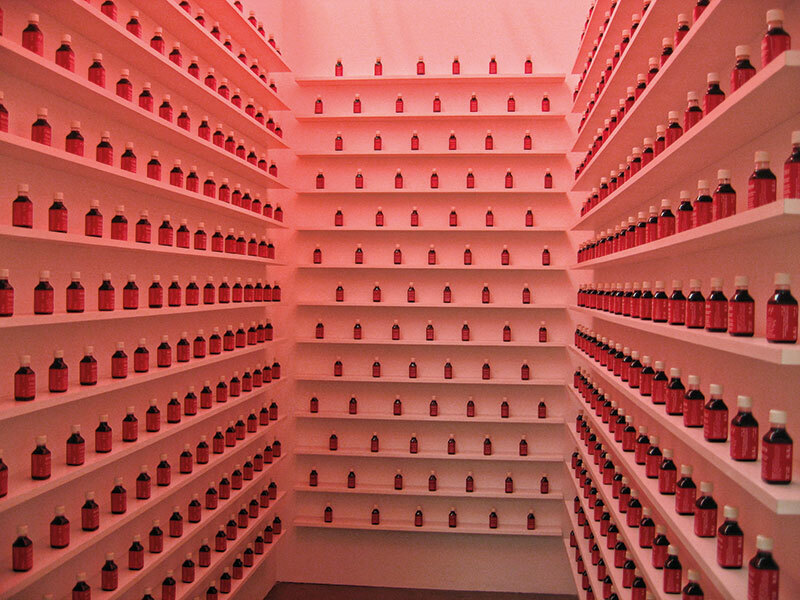 A particularly leading example being Nalini Malani, whose work began to challenge all boundaries of what was expected — working with theatre performance artists and creating large video installations that explored the world of Greek mythology, a metaphor for a growing, distorted political milieu. 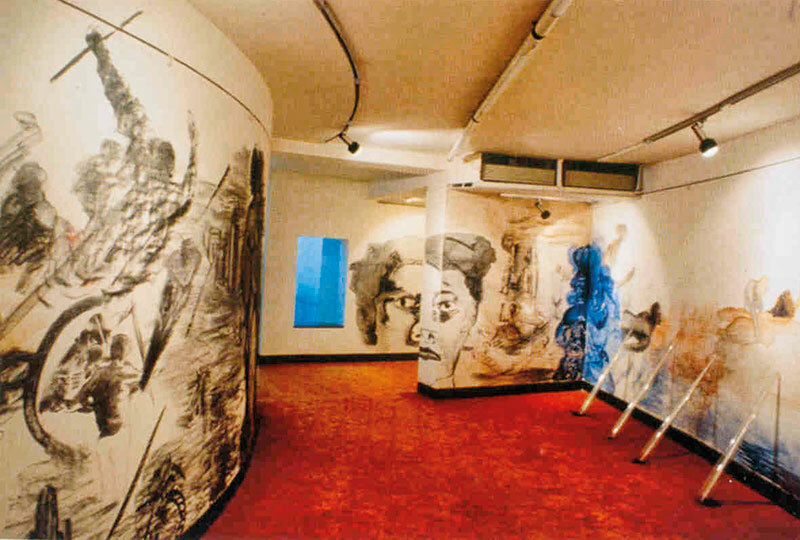 In City of Desires, Malani’s first site-specific installation in our little space within the Jehangir Art Gallery, you walked into the ‘artwork’ — with painted scenes of water on the wall, mylar oars that protruded from the ‘water’ to the ground, and the flooring which was entirely covered with red clay powder. It spoke about Bombay: the city of desire, a metaphor of all things desirable that got ravaged by the worst riots in 1992. For me it was also the beginning of understanding the term ‘conceptual art’, which started with a studio visit to Shilpa Gupta (now a celebrated international artist who has exhibitions around the world). Her space, emptied of all its contents, had a single rail on the ceiling with railway handles. It was an unforgettable feeling of bewilderment! I stood there gobsmacked, thinking, “Is this art?” Gupta was one of the early pioneers of this form. One cannot talk about this genre without mentioning the name Marcel Duchamp — the first conceptual artist was a pioneer of Dada, ‘a movement that questioned long-held assumptions about what art should be, and how it should be made’. He was interested in ideas. He began to work with found objects — Readymades as he called them. The ‘Readymade’ also defied the notion that art must be beautiful. Duchamp claimed to have chosen everyday objects based on a reaction of visual indifference, at the same time with a total absence of good or bad taste. In the late ’90s-early 2000s, Gupta, despite no gallery support or audience to speak of, continued, undeterred, to push the boundaries of what could be viewed as art. She went onto trains and became the seller of wares — ‘the ware’ being a simulated bottle of red paint signifying blood, the work titled Blame; passengers/customers were asked to choose from bottles that contained either Pakistani or Indian blood. Could they, the passengers/customers, see the difference? Was there a difference between the two Blame bottles? The age-old adage goes that artists are the signifiers of time — addressing issues that plague us and becoming record keepers of a moment in history. They often predict happenings — heralding the advent of terrible things to come. Like history books, like letters, art becomes a visual record of the times. The danger of this fine line that one walks when asking ‘What is art’ is that a lot of work can pass in the name of art. What makes a performance by an artist like Francis Alÿs, who walked with a leaking can of 58 litres of green paint, tracing a line for 24 kilometres that followed the portion of the Green Line that runs through the municipality of Jerusalem, a work of art? Versus that of an artist who painstakingly creates sand paintings of goddesses on Juhu beach? Why would those in the high echelons of the art pyramid dismiss that sand painting as kitsch, and Alÿs as sophisticated? As a gallerist, I am often asked this question — how does a certain work I show qualify as high art? It’s a difficult if not impossible one to answer. But at the cost of being simplistic, I would for the sake of argument, say: just as the seismic shifts of life have taken people in varying directions, so has art — that its many forms today compel us, give us new values, new ways of thinking, and allow us to engage with life in very different and meaningful ways. I conclude by saying what I should have at the beginning: I decided to approach the question ‘What is art?’, through my experiences of having encountered the different forms that I had the good fortune to be a part of in the contemporary art scene in India. Having laid a brief for all things other than good old-fashioned painting and sculpture, I would like to end by reiterating that while I feel deeply drawn to video, installation, conceptual and performance art, I am hugely partial to great painting too! Nothing moves me more than painterly gestures on canvas, or well-drawn figures in charcoal, or luscious watercolours on paper, or carved sculptures! Art, like life, has the diversity to hold within its unlimited canvas an ocean of ideas, giving us the opportunity to encounter the imaginations of creative minds that nourish, sustain, elevate and alert us, and are a constant source of motivation and inspiration to just carry on!